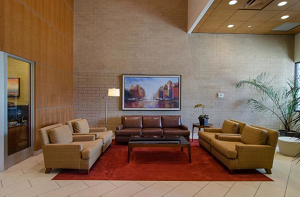 The Crossings pairs convenience with affordibility in the heart of downtown Minneapolis. 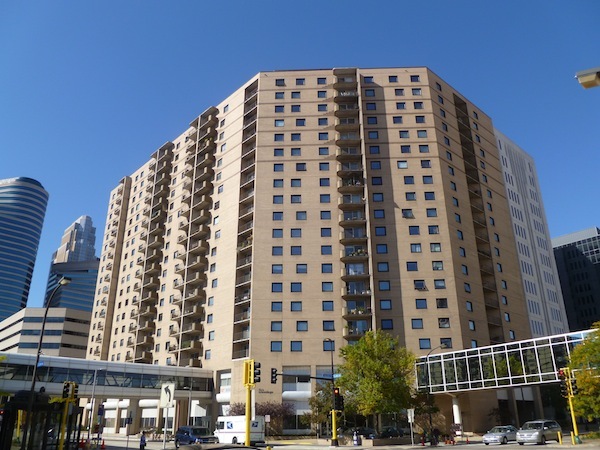 Located in the central business district, this modern high-rise condominium built in the 1980s by the same developers behind 1200 on the Mall in Loring Park. This building is connected to the Minneapolis Skyway System on the 2nd floor, and is 19 stories tall. With a total of 305 units in The Crossings, homebuyers have several floor plans to choose from, and will find many of the condos have been recently updated with ultra modern touches. Shared community spaces like a rooftop deck, community pool and exercise facilities with a hot tub and sauna, only add to the popularity of The Crossings condominiums. See condos for sale at The Crossings below or learn more about The Crossings condominiums. Ready to find your dream home in The Crossings? 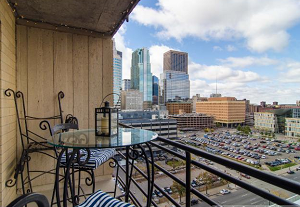 Contact us and we’ll connect you with the best downtown Minneapolis real estate. The Crossings Condominiums offer their residents with ample amenities for a modest price tag. 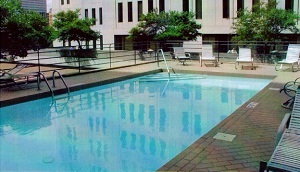 This building comes with plenty of shared outdoor space with an outdoor swimming pool, picnic area, and rooftop deck to enjoy. Inside, a well-stocked fitness area features a sauna, whirlpool tub, and workout equipment. In addition, residents have a party room for hosting guests. Location is the main draw for residents of The Crossings. On top of Downtown Minneapolis' many restaurants, bars, stores, and services, The Crossings is within walking distance from the post office, the Minneapolis Central Library, a grocery store, an ice skating rink, and the Mississippi River. Schools: New Horizon Academy (Public, K-12), Bernie's Montessori School (Private, PK), Lincoln International High School (Charter, 9-12), Fair School Downtown (Public K-12), DeLaSalle High School (Private 9-12).